I have tried to get Purple Corn several times in the past. Finally, I found a supplier that handled it. It is so dark it looks like coffee beans. Why is corn different colors? The more vitamins in a grain the darker and more colorful it becomes. This is the richest tasting cornmeal I have ever had. Wonderful! ! The first order – 150lbs sold pretty fast at the Winter Farmer’s Market in Indy. So, I have ordered more for the Maple Syrup Fest. Hopefully, I can get it ground, mixed and bagged before Sat. And, it is sitting on the living room floor right now ….. so I need to get it moved to the mill. I’m lucky to have an understanding wife that puts up with me. I haven’t been on your website in a good while, and didn’t know how much I had missed. It really is interesting to look at all you have done working on the dam. I know you have to be quite glad it is done!! 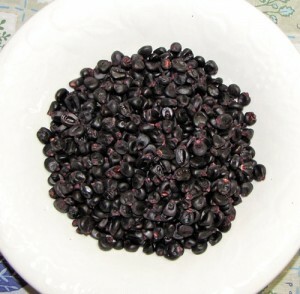 I saw / heard you talking about the black corn at your booth at the Maple Syrup Fair and am glad to get to read about it here to understand more about it. I hope you have a good year this year – hope to see you during the year. It was nice to see you at the Maple Syrup Fest. It was good weather and lots of good folks came out for it.